The Spring Summer Collection 2008 is now online! If you don't have your own hard copy yet - email me today to find out how to get yours. Did you know you can browse though the catalog online, this feature makes Virtual Workshops a breeze? 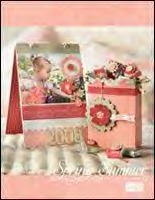 These catalogs are very easy to use, plus you can circle items you like, bookmark pages and make notes. Email me today for more information in hosting your own Virtual Workshop to earn FREE product!